Unleash the hidden powers of your machine and bring out the real performance of it! Eliminate factory low gear and top speed restrictions with this super easy and affordable mod. 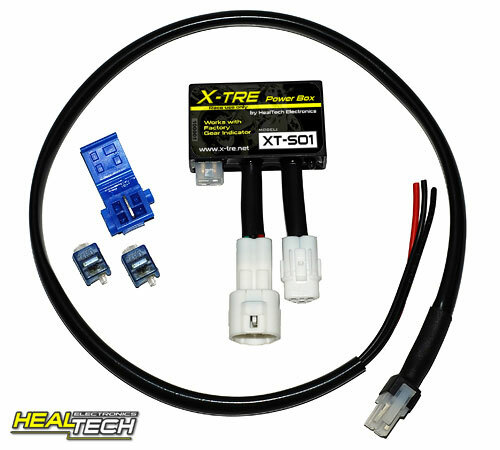 The X-Tre Power Box module is an advanced Timing Retard Eliminator which improves throttle response, low-end torque and also bypasses the speed limiter on all 1000cc+ Suzuki bikes. Designed for Japanese motorcycles with an OEM in-dash gear position indicator. The X-Tre Power Box won’t disable the factory gear indicator thanks to the built in microchip encoding/decoding the communication link between the ECM and the dashboard in real time. This feature is unique, as other TRE units on the market disable the factory gear position indicator. Just like our GIpro/ATRE, the X-TRE comes with user selectable gear maps, offering the same benefit and flexibility. But now, there is no requirement to have an external gear indicator when the bike already has one. Of course, we understand many riders will still want the GIpro unit for the large bright LED display – and for bikes without an OEM dash gear indicator, the GIpro/ATRE is still the best option available today. After installation, the unit is fully functional, no need to setup. The default gear mapping is the 4th which can be changed easily to 5th or 6th to suit your needs. Automatically switches off in Neutral for smooth idle operation; 3 user selectable gear maps – buttonless design; Status LED for troubleshooting; Automatic data link configuration to support all Suzuki models; Low power consumption with Auto Stand-by. The tiny box installs in under 25 minutes on most bikes, connecting through OEM plugs (only one wire would need to be cut during installation – we bundle high quality gel-sealed quick connects to make quick, simple, and reliable connections without the need for soldering). Another feature is the ability to simply review the gear map in use. The unit mounts under the fuel tank, out of sight, but the innovative buttonless design makes it possible to review and select maps while sitting on the bike. X-TRE works well with (or without) other electronic devices like a Power Commander or a SpeedoHealer, etc. You won’t find any better NOR a lower cost alternative on the market! Grab a bargain, grab those ponies.